The Long Island City graffiti mecca 5Pointz, which was literally whitewashed late last year, remains a target for street artists even as it slowly becomes luxury apartment buildings. 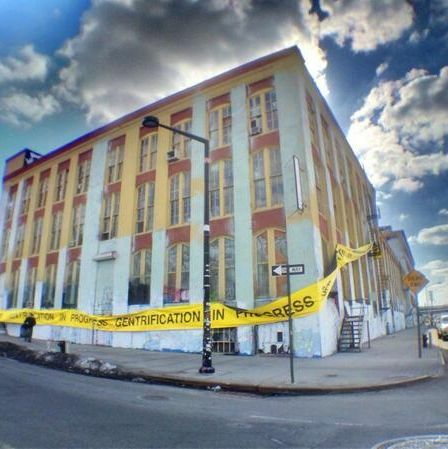 Over the weekend, what remains was gift-wrapped with a giant yellow banner warning, “GENTRIFICATION IN PROGRESS,” in case you were wondering how the local artistic community is taking the transformation. The project was a collaboration between gilf! (“Baffled at our culture’s lack of response to the crumbling structures of society she uses concept specific materials to present new perspectives to her viewers”) and BAMN (By Any Means Necessary). The building’s owner, Jerry Wolkoff, is planning two high-rise rental towers for the space, which he plans to have up by 2016. “I’ll have 60-foot walls for them to come in and express themselves,” he promised displaced graffiti artists in an interview with Daily Intelligencer. In the meantime, they’ll make do.